Editor’s Note: Macworld editors comb the floor at Macworld Expo every year, bringing you news, views, and information about all the latest Mac product news. But we’re a jaded lot—one of the few things we can’t provide is the view of the common man. Well, no one is more common in our book than John Moltz, editor-in-chief of Crazy Apple Rumors Site, so we asked him to chronicle his Expo experiences for us. First up: Attending a Steve Jobs keynote. The air is electric the morning of a Macworld Expo keynote. Actually, no, it’s not. People will say that, but that’s just hyperbole. Thank goodness! Electric air would be hell on the ol’ laptop. No, this is San Francisco, so the air the morning of a Macworld keynote is foggy. So foggy that when I saw two shadowy figures approaching me as I made my way to the Moscone Center Tuesday, I decided to take an alternate route—mostly because they were on Segways and while Segway people are never dangerous, they are really, really weird and not the sort you want to get sucked into a conversation with, particularly when you’re on your way to see Steve Jobs. Despite being well-versed in Apple lore, it didn’t occur to me at the time that one of those shadowy Segway riders was none other than Steve Wozniak. In my defense, I had been up late the night before studying how nerds party (the results of my study were singularly unsurprising), so I wasn’t at my most alert. At any rate, it didn’t really matter because, despite being a legendary co-founder of Apple, he’s still a guy on a Segway, which makes him weird. If you ever went to a Who concert in the 1970s, then you’re familiar with the entrance process for a Macworld keynote. Except in addition to the threat of being trampled, there’s a fate even worse, one that chills you to your very bones: You may just not get in. Some people with general admission passes lined up the night before to ensure their chances of glimpsing some shiny new Apple products, others got up at the crack of dawn. And when you’re out partying past dawn, that tends to present a bit of a logistical problem. Fortunately, there’s a Starbucks right next to the Moscone West. Unfortunately, the line to get into that is actually longer than the line to get into the Keynote. She felt bad about it, but the truth of the matter is that once you let in VIPs, media, speakers, Platinum and Silver pass attendees, highly placed political and sports figures, Apple family members, the Father the son AND the holy ghost, there just isn’t a lot of room left for educators. Even if you get in, you have to negotiate the mad rush to get down close and/or not to suffer the ignominy of getting shunted into an “overflow” room (read: “loser room”), where you watch Jobs on a screen instead of in the flesh. One woman even went so far as to strap a baby to her chest. Really. There was a woman there with a baby. For all I know, it wasn’t even hers! As I laughed to myself and vowed I wasn’t going to let some baby get in my way of sitting up close, I noticed something odd. The baby didn’t have a Expo badge on. Who did this woman think she was? That’s two people and only one badge! The injustice of it all was driven home when a gentleman walked by with what appeared to be an assistance dog and the dog was wearing a badge. In this demo from the Expo keynote, the new Location feature for the iPhone shows us precisely where John Moltz was sitting on Tuesday. I didn’t have the time to alert the proper authorities to this infantile interloper as the rush was on. Rest assured, however, that my seat was closer to the stage than the woman and her non-credentialed cargo. When Jobs takes the stage, it’s a magical moment. The cameras flash, angels sing and, rumor has it, Apple unleashes its secret weapon. “There’s something in the air”? Oh, yes there is. It’s ether. At least that’s what I heard. That they pump just a hint of ether into the Moscone West to make everyone more susceptible to Jobs’ message. And I did smell something. But, again, it could have been those Apple enthusiasts. You’ve probably heard the keynote news so I won’t go into that. But one of the best things about being here is being able to rush down to the showroom floor touch the Apple products that get announced at the keynote. While security will let you touch them, they won’t let you taste them. Not even a little bit. My protests that the MacBook Air was basically a big silver Chiclet fell upon deaf ears. Well, suit yourself, Apple, but it’s not like I’m going to buy one before I taste one! 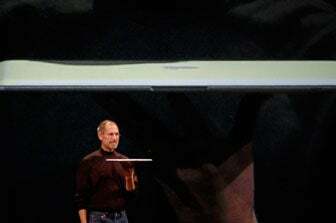 You may touch the MacBook Air, but not the CEO. In addition to touching Apple hardware, you can actually touch Apple executives and last year I did just that. I walked up to senior vice president of retail Ron Johnson and touched him on his arm. He was talking to someone else and after touching him I quickly walked away, as I just wanted to touch him, not disturb him. He looked confused but not concerned and I managed to avoid an unfortunate incident with security. This year I apparently missed senior vice president of worldwide marketing Phil Schiller by just a few minutes, but I haven’t given up on my goal of touching another Apple executive before I leave. Sitting at home, you don’t get as palpable a sense of the sheer size of Jobs’ will to make you buy stuff you really don’t need. Seeing his 25- foot tall mug grinning from ear-to-ear as he holds up the latest shiny objet d’Apple art you wonder what it’s all about. Why am I here? Why are press people from a dozen different countries here? Why is Sinbad here? Why is that baby here? Even Randy Newman, who delivered what can only be described as a left-wing polemic (and this from someone who likes left-wing polemics) is an unabashed supporter of the Jobs school of capitalism. Certainly not. And that is why Macworld Expo is different than any other “conference” you’ll ever go to. You can argue with the features of the MacBook Air. You can complain about the $20 fee for iPod touch users to get what iPhone users get for free. You can argue with the politics of Randy Newman. But there’s one thing that keeps us all coming back. And that’s the fact that Apple makes it own rules. People like that. I bet even that baby likes that. 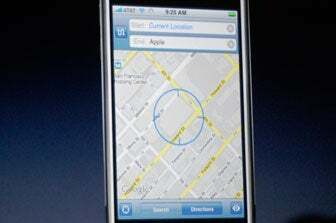 Tomorrow: John Moltz wanders the show floor in search of interesting sights and Apple executives to touch. John Moltz recently gave up the glamour of working in corporate IT to write online at his Very Nice Web Site. He does not respond to questions about whether he used to write what amounts to Apple fan fiction.